Notes: This is NOT a spicy, hot sauce. International cooks, please note: Use chili powder, NOT POWDERED CHILI PEPPER, which is extremely hot. For more on this recipe in my blog click here. 131 Comments on "Homemade Barbeque Sauce"
Im making the ribs with the rub and bbq sauce, but i am cooking them on the grill instead. My family insisted with some hickory wood chips. Sauce cooking away, will report back as to how my babybacks came out. This is forever more my go to perfect bbq sauce! Shame it took me 65 years to find it. It’s delicious! Do you use the light or dark brown sugar, or does it matter? The ribs look amazing btw!!! I used both the rub and made BBQ sauce! Loved it! My husband tried the sauce on his chicken and loved it. I will never use anything else. Where do you get the Spicey Mustard.. or what can I substitute for it .. can’t find it on Canadian shelves!! These are the best. Better than anything in a restaurant. Made this twice. The first time with your ribs recipe and then just because I was making something that needed sauce. LOVE! My whole family loves it! I will never use store bought BBQ. The ribs are amazing too. Thank you! I love your no knead simply wonderful bread and so does everyone that I share it with…and I make it much more often than I should. Your Fall Off The Bone Ribs are exactly that. I am really picky about BBQ sauce and like very few The recipe you shared with us for the ribs will be the only one I use from now on. It is much like my mother used to make. I asked my granddaughter if she wanted to taste what she thought smelled heavenly. With a giant smile and an empty spoonf she pronounced, “Who needs ribs?” Dinner was a big hit with everyone that evening!!! This is the second time I made this, but I am not sure why my sauce still end up running any ideas? Please list all of the ingredients you are using (be specific) and I will try to help. Wow Jenny, you are so helpful 🙂 New to your page and YT channel. Subscribed. I’m going to try your complete back rib recipe tomorrow. I made this again last night and it turned out really well. It’s not runny as before. I think the reason why it was runny on those two occasions is because of the ketchup I was using. yeah, the cheap kind, lol. On molasses…molasses delivers a deeper flavor than honey. Being diabetic I can’t use either of those and substitute Splenda ‘maple syrup’ and a dash of smoke flavoring. THANK YOU SO MUCH FOR YOUR POST!!! My husband is a diabetic and we are just learning about diabetes, so we don’t know what to substitute for sugar. Thank you for your suggestion so we can make this BBQ without worrying too much about my husband’s blood sugar. Any other substitutions for sugary recipes? This sauce is OFF THE CHAIN! Delicious. I added a couple of dashes of liquid smoke for a mesquite touch. I always have raw honey available, can I use this instead of molasses? My guess is that these two ingredients, being so dissimilar in color, flavor and sweetness, would significantly alter the final taste of the sauce, beyond what Jenny’s recipe delivers. That’s not to say it would not suffice in a barbeque sauce- only different. I have had the opportunity to try several of your receipts and WOW are they ever fantastic, just filled with so much flavor and love. Love your recipes. Hope to see more. Made this BBQ sauce and it was wonderful taste,and favor on it’s own.I baked chicken and spread on it was delicious dinner.Thankyou for the pat’s on the back,and making me dinner Hero for a night. Hi can I use veal instead of beef or pork ribs to make this recipe? I’m sorry, I have no way of knowing since I only make it with pork ribs. Can you grill with your recipe instead? If so any hints or comments? 9:Grill: To finish ribs on the grill, remove from the pan and place ribs on the grill (I use a basket over direct but low heat) basting and turning a few times for about 10 minutes. Making these tonight for me and the hubby — can’t wait!! Will let you know how they turn out – I’m sure they will be amazing! These ribs are AH-MAZING!! I made 2 racks instead of 1 and my husband raved. Thank you so much for posting your recipe — I will definitely be using this as my go-to rib recipe and your BBQ sauce is addicting!! And I love your website and you are adorable! Blessings to you!. I have looked at A LOT of recipes for great ribs. I’m making yours for my husband to take to tailgate at the KC CHIEFS & SAND DIEGO CHARGERS GAME SUNDAY. I hope they will be OK to put on a grill to warm. THANK YOU & I WILL LET YOU KNOW HOW IT GOES. Was wondering do I have to use olive oil? or is reg. veg oil ok? Any vegetable oil will be fine. What if I am making 3 or 4 slabs at a time do I have to increase the temp or time or both?? I have never made that many so I can’t say for sure but it seems to me that as long as the oven is big enough for the heat to circulate properly, you should not have to increase the time or temp. But it’s best to do a little research, especially look through the comments because some people have made large portions. How long will this Bar B Q sauce last. Is it preserved to last a long time? Can I bottle it to use for a couple months. Please advise. I have kept mine for several months, refrigerated, of course. Can you let me know if store bought bbq sauce is okay to use? Thanks. If you look through the comments you’ll see that a lot of people use their own, or store-bought, sauce. It’s my method that they like. Très bon! Excellent! Second time I make these ribs, always been a big success! Love the recipe in the oven. Merci Jenny, keep it up! I’m going to try this today. I’m not that familiar with the US-measurements like cups and so forth. How does it all add up to 1 cup (it says “makes 1 cup” in the beginning) when you add like 5 times a 1/2 cup of ingredients? That alone would make 2 1/2 cups right? Evaporation during Simmering brings the total liquid amount down to the stated total. Good Luck! Thanks, I think I misunderstood the question. Can you tell me how long can you have this recipe for? Im guessing it will go in the fridge once made so will it be good for 6 months? I keep mine in a jar in the fridge for several months. Once, I forgot I had it and it was in there at least 6 months. This is a great & easy sauce! And just like many of her recipes, it is fool proof. I was trying to multitask and misread the measurements. I used 1/2 Cup of spicy brown mustard instead of 2 Tablespoons. Not to worry though, I just amped up the other ingredients to counter balance. It is a great sauce! Pair this with her fall off the bone ribs and you will never go hungry. Great recipes! Just a tip: If you do not have molasses on hand, use 3/4 cup of dark brown sugar and omit the light brown sugar. 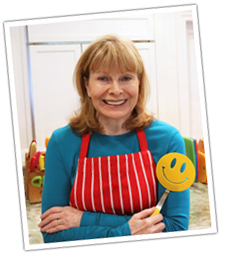 Keep up the great cooking and instructional videos! Hi, I’m a sort of international cook! and I have a question for you. Chili powder is a powdered seasoning mixture of dried chilis,garlic,oregano,cumin and cloves. Is that what you are talking about? Could you please give me a name of commercial brand? such as McCormick Chili Powder. I am wondering if this product (Mccormic Chili powder) is suitable for your recipe. How do you make your rub? Rub recipe that I used on my ribs. Everything came out of this world. Thank you Jenny. Hi, just finished making the sauce. I doubled the batch and was having trouble trying to get it to thicken, so I made a roux. I didn’t know what else to do, lol. Any suggestions for next time ? By the way it was delicious! You could try cooking it longer. Occasionally, I cook mine a little too long and it’s actually too thick and I have to thin it. It’s been my experience that almost anything cooked long enough will eventually reduce and thicken. Can i leave out the 1/2 cup of chopped onion? Onion adds a lot of flavor to any recipe so the sauce won’t be quite as rich if you leave it out. Yes, but best when flavored with onion and also 1/2 lemon. Squeeze the juice from lemon into sauce pan and add peel to sauce along with fairly large chunks of onion. Simmer sauce as Jenny has written, After a very slow simmer of about 15-20 mins, remove onion and lemon peel. Also to hide onion from kids or those who don’t like onion, blend it to a puree and no one will ever know the difference when added to sauce except for a better flavored sauce. Onion is awesome so when called for, do not exclude it from recipes, just disguise it!!! I also add 1/2 stick of real butter to sauce. If you use dark brown sugar I would not omit the molasses because it adds to the syrupy nature of the sauce and whatever molasses is in the brown sugar would not compare to the richness of thick molasses. Hi Jenny! I want to make your barbeque sauce and I just want to know if you use light brown sugar or dark brown sugar. Can’t wait to try it. Hi Jenny! First, I have to say that you look gorgeous! Would you PLEASE share your anti-aging recipe with us?? Your recipes are amazing! I found you on You-Tube while searching out an easy whole-wheat bread recipe, and you’ve got the best!! Now, I’d like your advice on how to change the BBQ Sauce to sugar-free! (I’m not able to have any sugar, whatsoever!). TY! I’m sorry but I have no experience with sugar alternatives. If you can’t have any sugar, you know more about substituting for it than I do. A sauce like this is very forgiving so whatever you use in your other recipes is worth trying in this one. I don’t recall a question like that. Thrilled you wrote the recipe out as there was something wrong with the video. It wouldn’t go past oregano…. Maybe because there was over a million hits! Thanks for sharing – love your enthusiasm! hey , I just made this rib recipe with country style boneless ribs, because that’s what I had. It was fork tender and finally the taste was right! I don’t care for bbq sauce but this home made cooked down one is fab. I also love the idea of not buying store bought stuff with all those preservatives. I’m keeping this recipe on my Pinterest. I can say that I’m sure that everyone will love these! This BBQ sauce is amazing! I had some chicken wings that I wanted to make in my new pressure cooker and thought i had some BBQ sauce in the pantry when I realized i did not have any I decided to give this recipe a try. It was super easy and the wings I made turned out to be the best wings that I have ever had. I will be making them again on Sunday for the football game and many many more times. Thank you! I’m going to make the ribs tonight for dinner. I can’t wait to try your rub and BBQ sauce recipes. They look incredible. I will let you know how they turn out. Thanks a bunch. Excellent sauce ! Made them for Christmas dinner because that’s what my girls wanted was ribs. They couldn’t stop talking about them. thanks for your ribs recipe, I’m going to do it today for the first time. However I’m from Germany and I don’t know the difference between chili powder and powdered chili pepper. Products which could be chili powder / powdered chili pepper are red flakes (is this powdered chili?) and a powder which kinda looks like sweet paprika powder (is this the proper chili powder?). I am planning to cook 6 racks of back ribs how much extra time do you suggest for cooking. Thanks! Also can I cut them in two or do I need to cut indavidualy. You can cut them in twos or threes or not cut them at all. They will still fall off the bone. I’m not an expert but it seems to me that ribs take the same length of time to cook whether it’s one rack or six. By the way, you can cook them in advance, cool & refrigerate, and then just finish them the day you need them. Scroll down to see how some people have cooked multiple racks. I would set the oven temperature as high as it will go and move the rack to the top of the oven because ovens are always hotter at the top. I’m home bound from a shoulder reconstruction (last week). I’m going to surprise my wife with these Monday evening dinner (tomorrow in Sydney Australia). expecting this will go down a treat! My family enjoys your bbq ribs, thank you so much for sharing your own recipe. Are those heat resistant gloves that you used in your video to handle the ribs? If so where can I buy a pair? Thanks in advance for your reply/answer. They are just Playtex kitchen gloves, the kind used for dish washing but I use clean ones out of the package. They are thick enough to handle hot ribs. 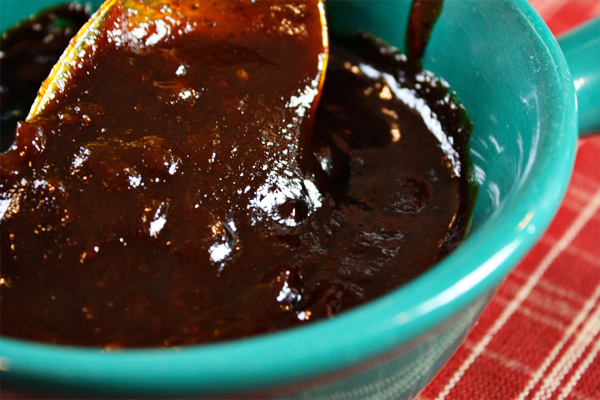 Can’t believe I can make this BBQ sauce! 😉 Turn out to be excellent! Great recipe is it powder mustard for the rub and liquid mustard for the sauce ? Cant wait to make this recipe! I dont have spicy mustard can I use yellow mustard or will this have a dramatic difference to the taste? There is a big difference between yellow mustard, which has a tangy bite to it and spicy brown mustard, which has more depth of flavor so I don’t think I would make the switch. If you can’t get spicy brown I would substitute dijon mustard. Thank you Jenny! Ill make sure to go buy spicy brown mustard. Hello, I don’t have Worcestershire Sauce, or soy sauce, Can I just leave it out or what can I use? There is no soy sauce in my recipe but Worcestershire is found in most barbeque sauce recipes. It’s a strong and complex addition to the sauce and there’s really nothing like it that I know of that you could use as a replacement. We followed this method but we used a famous dry rub already made in a jar. The problem was the ribs got very salty. What should we do differently? We love the method of baking. That famous dry rub was probably very high in sodium. Next time, try my rub. How does this sauce stand up in a pressure cooker? Does it become thin or separate during pressure cooking? I haven’t used a pressure cooker in years but always thought it was for cooking things faster, that would normally take a long time. I don’t know how this recipe would turn out in a pressure cooker but I can tell you that when I cook it too long on the stove it gets too thick. It only takes 25 minutes to cook this sauce on the stove (where you can keep an eye on it and stop when it’s as thick as you want it) so you may not need to use a pressure cooker. She wasn’t asking about it cause she wanted to make the sauce in the pressure cooker, she was asking how it stands up, cause she probably wanted to cook the meat in there, not make the sauce itself. I love your recipes, but think you need to read your comments better, you seemed to misunderstand several of them. Thanks for the recipes. Please let me know any other ones I misunderstood and I will try to correct my reply. It’s hard since this is just a hobby I do for free and I get overwhelmed with all the questions. Thank you. Excellent recipe, Excellent ribs ! ! ! Used your recipe for bbq sauce and the rub as well…. worked great. One question…. the cider vinegar, can you use apple cider vinegar? You’re right, it’s the same thing. This recipe makes only one (1) cup? Yes, that’s what my sauce cooks down to. I always wait until my ribs are almost fully cooked before I slather them with BBQ sauce, let them cook about 15 minutes on one side, turn them over, slather that side with BBQ sauce and cook 15 more minutes. I learned the hard way the any sauce with honey, molasses or ketchup in it will burn on the meat if left on too long. I’ve cooked mine fully in the oven before and I’ve cooked them 90% done in the oven and then finished them on the grill. Either way they’re always delicious. I’m a Southern girl and we love ribs. Can you please make a video making the BBQ sauce? I keep mine in a jar in the fridge. I’ve kept it as long as 2-3 months. I always wanted to make my own barbeque sauce and this is excellent. The ribs are also the best ever! Is that powdered mustard or mustard liquid in a jar,we don’t have that mustard here in australia.thanks Lorraine. It’s the liquid kind in a jar. thank you for the easy and yummy recipes (^-^). can you use honey to replace molasses? can you substitute the molassas for something else? You can just leave it out or use honey instead. Is it suppose to be liquidy? Or wen it cools it will become thick? The sauce will thicken after it cools so I usually stop cooking once it gets a little thick, or just thick enough to coat a spoon. I usually use it right way so I cook it until it’s thick enough to stick to my basting brush. Once I cooked it too long and it got too thick in the fridge but I just added a little water and it was fine. I have used this recipe for years (1964) and I thought you might like it as it is very similar to your BBQ sauce. Sweet and Sour BBQ sauce. 1 C lightly packed brown sugar. Mix in saucepan, then stir in..
Bring to a boil and simmer 10 minutes. Serve with spareribs, meatballs, ham steaks.